Released and named for the International Year of the Volunteer, Camellia Volunteer is a compact growing japonica camellia with anemone type flowers. Flower color is a pink when first opening darkening over time. Paler edges set the flower off beautifully. Reaching around 2m in height and with good tight growth this is an excellent plant for container growing and would also make an wonderful mid sized hedge. Well suited to slightly acidic soils and good solution for a south facing position. Camellia Volunteer can be lightly pruned after flowering to maintain a bushy shape. Stake to encourage an upright position and water well with a liquid seaweed fertilizer to promote good root growth. Mulch around plants to keep a cool root run. Plant Camellia Volunteer at around 1m apart to form a dense hedge. 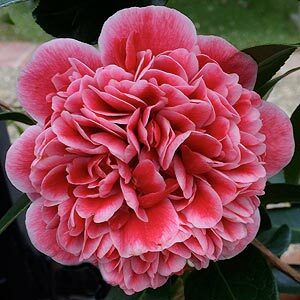 This is also an excellent camellia for growing in containers, it is not only naturally compact, but is also easy to prune like most camelias. Height – Reaches 2m and is easily pruned to stay at this height. It will get taller if left.